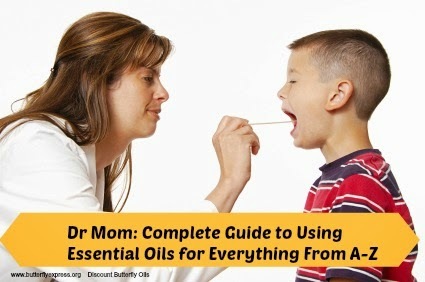 Discount Butterfly Express Essential Oils-up to 30% off: How to clear a stuffy nose with essential oils! Just one more way Butterfly Express essential oils make my life easier! How to clear a stuffy nose with essential oils! Just one more way Butterfly Express essential oils make my life easier! 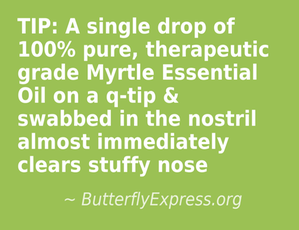 TIP: a single drop of Myrtle on a q-tip and gently swabbed inside of each nostril almost immediately clears stuffy nose! Most essential oils would irritate and burn the mucous membranes if used in such a way, but Myrtle, a member of the eucalyptus family, is mild and gentle enough to be one of the very few oils that can be used this way! The results are nearly immediate and truly amazing! Try this for cold/flu, allergy season, sinus infections...any time the nasal passages are blocked and "stuffy!" Note: Because this method puts oils directly in contact with sensitive mucous membranes, it is of vital importance that you try this only 100% pure therapeutic grade essential oils. Lesser quality oils could have traces of chemicals used during the distilling process or contain fillers or be cut with substances that could irritate the nose or even cause infection. Is Myrtle known as something else? We have doTERRA oils and there are no oils with that name. Thanks. Hi Dawn, Myrtle is a milder, gentler cousin in the eucalyptus family. I don't believe DoTerra offers it at this time (their selection of singles is quite limited).